EnViZion, QLD – IS A FINALIST FOR THE IDX Pathways and employment AWARD PROUDLY SUPPORTED BY Microsoft. EnViZion is an Indigenous owned and operated company founded by Julie-Ann Lambourne, a Torres Strait Islander woman descending from Mabiaug and Darnley Island. EnVizion Group has designed and developed a world first purpose built, state of the art, mobile training facility which can be taken to all areas across Australia, including remote locations delivering a cutting edge virtual reality experience. We asked Julie-Ann Lambourne and the EnViZion team a few questions about their work and why embracing digital technologies is important for Indigenous people and communities. The opportunity to show Indigenous people of all ages, from all different locations; what employment options are available in an immersed environment. 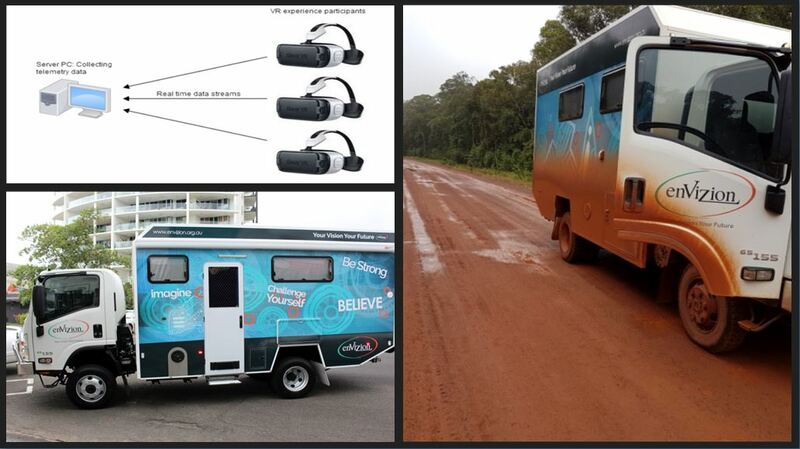 The utilisation of virtual reality technology in a purpose built ‘all terrain’ vehicle that takes the technology to remote locations. The interest within the community before viewing the VR experience but the difference afterward viewing the VR experience – complete changes in thought, motivation and transition to employment. Debunking the myth that Indigenous people don’t work – all story tellers in the VR experience are Aboriginal and Torres Strait Islander who are employed, run business and are successful. Challenging – Explaining what the virtual reality project is, when people have no concept or no knowledge and/or involvement in technology. The exciting part to that is – when they ‘get it’. They want to know more. Being introduced to technology over three years, completely changed my world. The opportunities that technology can bring to Indigenous people is unbelievable and amazing. My instant thinking was – this is a ‘game changer’ and there are now ‘real’ opportunities to be on an equal playing field. enVizion was established because we saw so many gaps in programs for Indigenous people and from our own personal experience, we knew how to teach ‘our mob’ how to overcome circumstances and situations towards prosperity. We truly believe that one of the foundations to parity is employment and to offer all the wrap around services to build and support our mob. Technology offers a new form of hope, opportunity and economic development. Indigenous people generationally and current are entrepreneurial leaders. Technology will take this to a whole new level. This also includes the prospect to record culture and language. In remote locations where there are not many employment opportunities; technology will give rise to economic development especially in the areas of business development. With effective advice, training and mentoring, Indigenous people will have the opportunities to work local, state, national and globally.